Essays & PapersThese Millennials Are Running Franchises With Their Parents. Here’s What They’ve Learned. Jon S. had long known just how suited to his son was. Jon P. was levelheaded. He didn’t shy away from having hard conversations when people didn’t meet his expectations. He was a hard worker. Yet he’d never really considered working with him before. But “during those meetings [at Toppers Pizza], I thought that it would be a hell of a lot of fun to work together,” Jon S. says. On the ride home, he asked his son to join his franchise team. It turned out to be a great idea. That was five years ago. Today the father and son own three pizzerias in the Omaha area, with a fourth on the way. While Jon S. handles and , his son is in charge of the day-to-day operations of the stores. The Crowes are not alone. While it seems like a recipe for disaster (kids listening to their parents? yeah, right), franchise brokers and franchise brands report that increasing numbers of parents and their children are going into business together and enjoying fantastic success. Marty Welch, founder of Martin Franchise Consultants, says the landscape for multigenerational franchisees has changed quite a bit in the past decade. Twenty-five years ago, he says, most multigenerational deals involved a parent “buying a job” for an adult child who was having trouble finding their way in life or holding down a corporate position. More often than not, it was a bad investment. Now, he says, parent-child franchisees have a different . Going into business together is a way for both generations to exit the rat race. Many older workers have bounced back from the recession but live in fear of losing their jobs as they age and are disappointed in a lack of wage increases. Younger adults also suffered during the recession, which has them looking for alternatives that allow for more and job security than the corporate world provides. Franchising offers an alternative for both. Not only did Colter Lange’s parents have that type of trust in him, his sister did, too. The Lange family worked in the oil business near Midland, Tex., and wanted to hedge their bets against the area’s boom-and-bust economy. Colter, in particular, was interested in stepping away from oil. He looked at several options, but his mother, Lisa, convinced him to look at franchising. One day when the two were visiting Colter’s grandfather in Denver, they stumbled on the , an upbeat restaurant serving sandwiches, wraps and soups. They knew the brand would fly in their corner of Texas, and they signed on. Colter and his parents each took a 45 percent stake; his sister and her husband, who is a lawyer, agreed to provide legal services for a 10 percent stake. While everyone else kept their day jobs, Colter committed to the brand full-time as caretaker of the family’s investment. The Crowes haven’t endured any major conflicts so far as they’ve been building their pizza empire. Their disciplined separation of their business and personal relationships is a big help. In the beginning, Jon P., who lived in a different town, was spending five nights a week at his dad’s house. “We would work together 12 hours a day, then come home and talk shop three to five hours after that,” he says. Now the father and son try not to talk business with each other after 8 p.m and are trying to move any off-hours chats to a weekly standing lunch appointment. For Lucas Bergeson, the key to maintaining a positive family dynamic was figuring out the right role for himself, his brother and his father while developing their franchises in Fitchburg and Madison, Wis. Lucas, 25, learned that his strength is in and operations. His brother, Josh, 28, enjoys working on the financial side of things. Their father, Randy, handles more strategic matters, though everyone fills in when needed. “We all have different interests, and we couldn’t have planned it any better,” Lucas says. 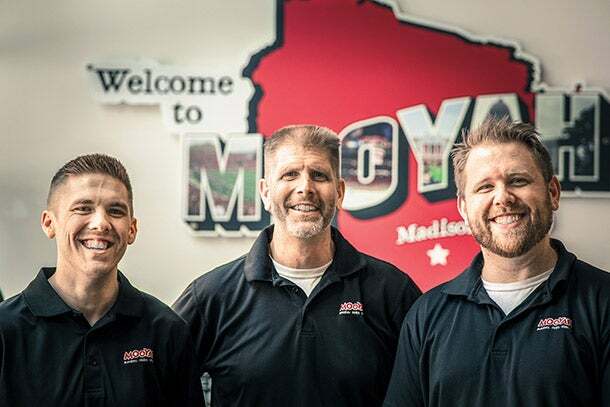 From left: Lucas, Randy, and Josh Bergeson of Mooyah Burgers. Randy, who also runs several Subway franchises, says he was surprised when Lucas showed an interest in working with him. Soon after high school, his son asked if he could join the family business. Randy told him to go to college, and if he was still interested after he graduated, he would consider it. Lucas only got more excited about the prospect over time, and the father and son began looking at franchise concepts while Lucas was still in school. That’s when they found Mooyah. Josh also expressed an interest in starting a franchise with the family. “At that point, I thought, Oh, shoot, this is getting serious,” Randy says. The Bergesons signed on with Mooyah, then spent the two years between 2012 and 2014 searching for the right locations to open their first restaurants while Lucas finished college. Over the course of 2014 and 2015, Josh became general manager at the suburban Fitchburg location, while Lucas took over a location in downtown Madison. The team is developing three units in the Portland area, and will build equity over time. Like in all businesses, the early days were difficult. Demand for their moving service was high when they launched at the beginning of 2016, but the twentysomethings found the labor market in Portland to be a challenge; legal marijuana use in the area made it difficult to find drug-free employees and it was hard to attract people willing to do the hard physical labor required every day. But Bernardo, Joe and their team are finding their footing with guidance from Fred. In the end, that’s what multi­generational franchising takes to succeed — two parties with an equal to success, even if they don’t start out with equal experience or financial resources.